F.F. Palmer Del. From a Sketch by H.D. 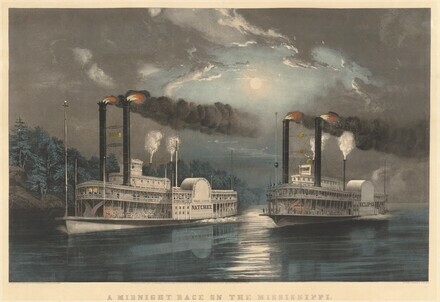 Manning of the Natchez / Entered According to Act of Congress in the Year 1860, by Currier & Ives, in the Clerk's Office of the District Court for the Southern District of N.Y. / A Midnight Race on the Mississippi. / New York, Published by Currier & Ives 157 Nassau St.
Three Centuries of American Prints: from the National Gallery of Art, National Gallery of Art, Washington; National Gallery in Prague, Prague 1; Antiguo Colegio de San Ildefonso, Mexico City; Dallas Museum of Art, Dallas, 2016 - 2017, no. 31. Conningham, Frederic A. Currier and Ives Prints: An Illustrated Check List. New York: Crown Publishers, 1970, p. 180, no. 4116. Reilly, Bernard F., Jr. Currier & Ives, A Catalogue Raisonné: A Comprehensive Catalogue of the Lithographs of Nathaniel Currier, James Merrit Ives and Charles Currier, including Ephemera Associated with the Firm, 1834-1907, volume 1. Detroit, MI: Gale Research Company, 1984, pp. 437, 458, no. 4476.